This is the 4th post of Skin pH series: Read the 1st post on Understanding Skin pH and its Impact here, 2nd post on Overly Acidic and Alkaline Skin here and 3rd post on Diet, Environment on Skin here. MarcieMom: Thank you Dr Cheryl Lee for helping us understand skin pH and sharing with us last week on what to watch out for in our diet and environment. Today we focus on the skin’s itself and the products we use on it! I understand that newborn baby’s skin is of higher pH of about 7. Moreover, certain parts of the body is more acidic/alkaline than others. MarcieMom: What are the key endogenous factors parents should note to help manage the child’s skin pH? For instance, not let sweat stay on skin? What about ethnic and genetics? Dr Cheryl: Babies are born with a relatively alkaline skin pH because they’ve been incubating inside the mother’s more alkaline amniotic fluid. Newborn skin is covered with an amazing moisturizer called vernix caseosa; a waxy coating that obviously works to make the babies relatively waterproof while in the womb. Within days of birth, the pH of the newborn skin begins to dry out, acidifies and then the acid mantle becomes intact. For this reason, it is important to use moisturizers that are in the optimal pH range for babies too. In a recent preventative study of the infant siblings or children of those who have atopic dermatitis, twice daily moisturization with a hypoallergenic (meaning no fragrances, no essential oils, no plant extracts, no formaldehyde-releasing preservatives, no lanolin, no neomycin, no bacitracin, no methylchloroisothiazolinone) moisturizer in these newborn babies lead to an approximately 50% reduction in rates of new onset atopic dermatitis. I love this study because it tells us a lot about the connection between our skin barrier and our immune system. By optimizing your skin barrier and sealing it off from the outside world, and by avoiding as many chemical exposures as possible, we can prevent the immune system from developing the inflammation associated with eczema! I would also venture to say that this may be the way to avoid asthma as well. When allergens come in contact with the skin, then the allergic type of inflammation is turned on. On the other hand, it has been shown that if you can avoid letting allergens (including foods!) from coming in contact with the skin long enough, then your child’s immune system will build up tolerance to the food when it is presented to the immune system of the gut. What this tells us is that, in susceptible populations, the skin barrier needs a little help as it is maturing. By using a pH-optimized and hypoallergenic moisturizer twice a day, you may be able to help your baby to build an effective skin barrier that is not as overreactive as it is in eczema. Our skin is truly the window to our immune system and skin barrier optimization (SBO) is extremely important in treating and preventing atopic dermatitis. As for ethnic variability in the skin barrier, there have been documented differences in relative concentrations of lipids in the skin of caucasian versus asian versus black skin thought the relative ratios are all the same. To my knowledge, there is no interethnic difference in the optimal skin pH. Genetics absolutely play a role in the propensity to develop atopic dermatitis. Conditions like ichthyosis vulgarism predispose one to dry skin, an overly alkaline skin pH and to the development of atopic dermatitis. As for sweat, the biggest problem is the irritancy of the sweat itself. The salts from sweat can crystalize and act as an irritant to the skin. If you can see that your baby’s sweat has dried and has a salty residue, then I would recommend rinsing it off with plain water (no soap) to prevent it from becoming an irritant. If the sweat is not crystalized, I wouldn’t worry about it much. Food on the skin; again this is another issue of major importance in atopic dermatitis. Studies have shown that when food is left on the skin for extended periods of time in early infancy, the child is more likely to develop an allergy to that food. Be sure to wash your child’s hands and face after eating! Marcie Mom: Many products are marketed as of ‘skin’s natural pH’ or ‘pH-balanced’. What does this mean? 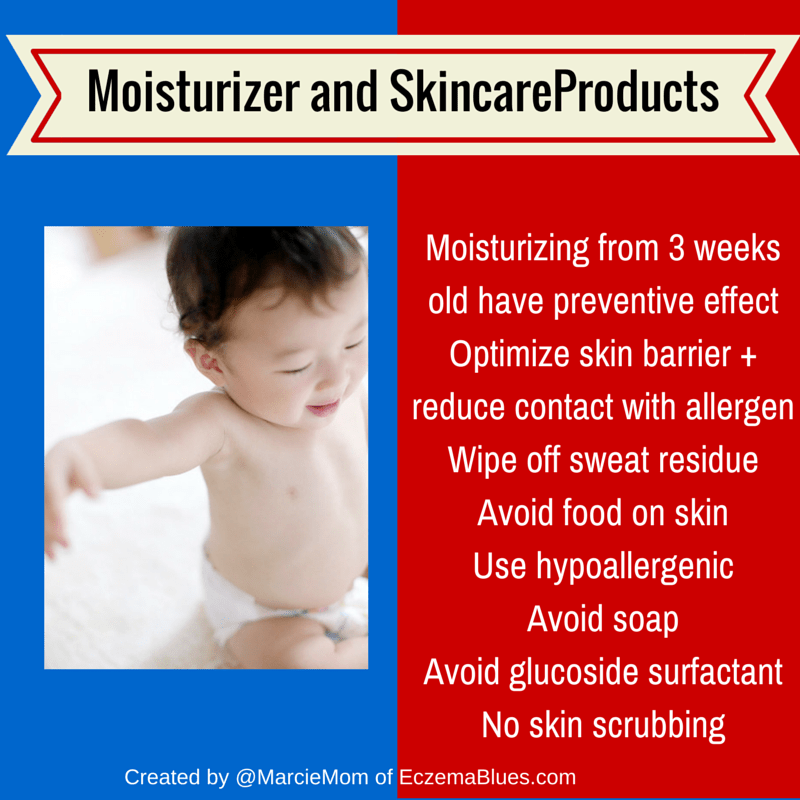 When can a parent start moisturizing baby’s skin (given the pH changes)? Dr Cheryl: The term “pH-balanced” is completely unregulated and could mean anything—including that the product could actually be alkaline. The consumer has no way to knowing what the pH of a product is unless they actually test is with a pH meter or if the manufacturer were to put the pH ON the package. As for the TrueLipids products, we conducted long term stability studies on the pH of our formulations so we know that they are within the optimal range of 4.6 to 5.6 for extended periods of time and even in high-heat environments. Additionally, many products contain benzoic, lactic, sorbic or citric acids to bring the pH down to the acidic levels. These acids can sometimes be allergens (sorbic acid and benzoic acid can cause hives when they come in contact with the skin. Benzoic acid can cross react with those who have fragrance or balsam of Peru allergies which are common in atopic dermatitis) or these acids can act as an irritant if they are formulated in such a way that the acid can precipitate and turn into a salt easily. The pH system in the TrueLipids products employs and acid called gluconolactone. I chose this poyhydroxy acid in my formulations because it is not only an effective way to acidify a formulation without crystallization of the acid (in my own experimentation), but it has also been shown to reduce the loss of water from the skin and has anti-oxidant and DNA-repairative properties as well. As for the appropriate time to start moisturizing the skin of a newborn, the skin of the newborn acidifies within the first few days of life. Three weeks of age has been shown by Simpson et. al., to be a safe and effective time to start moisturizing the skin of a newborn who is at high risk of developing atopic dermatitis. In this study, the babies were moisturized at least once a day and 50% fewer cases of atopic dermatitis were noted by the age of six months! The skin of a newborn acidifies within the first few days of life and so I do not think it is necessary nor beneficial to use a more alkaline moisturizer on a newborn. It is probably best to leave the skin of brand new babies alone until they are three weeks old. Of note, studies have shown olive oil to be detrimental to the newborn skin barrier, so it is best avoided. MarcieMom: Which products are clearly bad for skin due to its pH level? For instance, detergent and soaps? These anti-bacterial products (containing benzoyl peroxide, triclosan, sodium lauryl sulphate and sodium laureth sulphate) help to kill staph bacteria but its pH level (and ingredients) lead to skin irritation. What is the skincare approach to ensure killing staph bacteria adequately without causing skin dryness? Dr Cheryl: First of all, it is best to limit the use of soaps altogether when possible. Soap should only be used when needed to remove dirt or oils that don’t belong on the skin. Otherwise, soaps should be revered for washing of hands and hair when it is dirty. Soaps, cleansers, shampoos and body washes should all be in the optimal acidic range of 4.6 to 5.6 and should be non-alkaline. Products that deposit and oil as you use them can also be beneficial. Avoid any surfactants with the word “sulfate” at the end. Sulfates have been demonstrated to be very destructive to the skin barrier and remove the lipids from the skin barrier leading it to dry out and to develop allergies to chemicals more easily. As for optimal soap surfactants, there is a lot of very interesting science that can direct us to make the best choices for our sensitive skin. Surfactants are designed to remove dirt and oils from the skin, but the problem is that they can also remove the lipids from the skin as well. This leads to disruption in the skin barrier and exacerbates all the skin barrier problems in atopic dermatitis. It has been postulated that charged anionic surfactants may be more detrimental to the skin barrier than nonionic surfactants, but it has been noted that nonionic surfactants more efficiently remove stearic acid (a fatty acid in the epidermis) than to anionic surfactants. Anionic surfactant-based cleansers also alter the lipids of the epidermis more than do the anionic surfactant sodium cocoyl isethionate. Another factoid about surfactants is that the larger the polar head group on the surfactant, then the less it is able to interact with and remove lipids from the skin barrier. Of note, a recent study by Belsito et. al., showed that the surfactant cocamidopropyl betaine (CAPB) is more likely to cause allergic contact dermatitis in people with atopic dermatitis than in those who do not have atopic dermatitis. I also like to avoid the glucoside surfactants as they are also relatively common allergens in the general population and can cause eczema of the eyelids and hands that can be very tricky to figure out. I have been working on a cleanser that is optimized for atopic skin and it will be available next spring. It will have the best surfactants for sensitive skin. One more little note in regards to cleansing atopic skin; never use anything to scrub the skin other than your hands or a very gentle wash cloth. Loofah sponges, and scrubbing brushes do not belong on atopic skin (or normal skin for that matter). Thank you Dr Cheryl for sharing what to look out for in cleaning and moisturizing our eczema child’s skin. Next week, we will focus on Eczema and Skin pH, and how to reduce the alkalinity of eczema skin. I think this article is very interesting! Ingredients are a key factor both as a trigger of eczema, and as agents to bring soothing relief. Interesting! There’s much more to moisturizer than just ingredients and I sometimes wonder how made at home products compare against those formulated in the lab. Will be interested to know more, and am sure parents reading my blog will be too! Home made products are an attractive alternative to commercial products, for various reasons, the most obvious one being that you feel sure of what has been put inside. Unless you have a specific (and expensive) equipment, you can just make very simple structures for your cream. To avoid being to long, I will discuss here just about common cream (Aka oil-in-water emulsion, like a mayonnaise). You don’t have the same shear strength for example, that what you can have in an industrial rotor, nor the same control of temperature. So you can only make single emulsion with heterogenous size of the oil droplets, most of the oil droplets being very huge from a microscopic point of view (several to tens of microns). And actually, size matters. It matters in the amount of oil droplets you can have, for example and finally the amount of oil you can add to your system. Considering that most of the active ingredients are lipohilic (soluble in oil, not in water), you will have an effect on the level of active ingredients you can have. Furthermore, by using various techniques not easily reproducible at home, you can have access to other structures than just oil-in-water cream. In my case, I have worked on a structure that looks like a cream, but is a gel instead, in a heterogeneous matrix, and this without using polymers. It enables me, for example, to have more space to incorporate active ingredients, and it enables also a delivery in time that you cannot achieve by a simple oil-in-water emulsion. I am well aware that many commercial creams have too many ingredients, and not the best ones for sensitive skin. It is explained by how these creams are designed. Basically, a cream is a derivate of a blank formula, which has been shown to fulfil stability tests and cosmeticity tests (how pleasant it is, to apply the cream on skin). The more tensioactive ingredients you add, the more stable it will be (generally speaking). So one after the other version of a skincare, for a brand, one just add more ingredients, without carefully considering the composition. And that’s why I am fully convinced that there is a very promising approach, which is combining the will to carefully select what is inside a skincare, by using the minimum of ingredients, and very safe ones, with an innovative way to design the structures of skincare, this innovation in the structures being enabled by the technical opportunities that offer industrial processes. Thanks for taking time to share, enlightening as it’s something I wondered about for a long time. Be emailing you too, thanks!